Thing is, those cheap plastic storage containers don't last all that long. The super-lightweight lids fly off the top dishwasher rack and end up partially melted on the bottom. And for some reason, leftovers just don't taste as good when they're stored in plastic cups. That's why I was super excited to upgrade my food storage collection to a covered glass Pyrex set. I jumped on these when they went on sale. 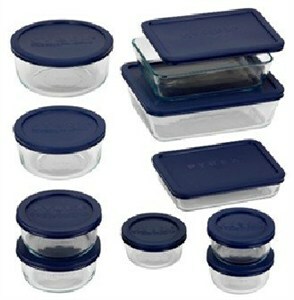 This Pyrex Storage Plus 20-piece set has seven bowls and three casserole dishes. Each comes with its own fitted BPA-free lid. The pieces are safe for use in the dishwasher, fridge, and freezer. As enthusiastic as I was to receive this set, my hopes were momentarily dashed when I began to check for defects and discovered that I couldn't get the friggin' lids on any of the containers. Not one. The lids are made to be extremely tight fitting -- key word there being "fitting," I thought, as I sat there trying to shove each stiff lid in place to no avail. But I wasn't ready to give up just yet. I ended up solving the lid problem by bending them as close to in half as I could, back and forth in both concave and convex directions. This loosened up the stiffness of the lip edge, and after a while, I got the first lid to fit a container. Success! After that, I only had to loosen the lids a few more times before they started fitting on their own. This set has been in my possession for over 6 months now, and I have no complaints. The lids are easy to get on now, very tight fitting and still holding their shape, and the glassware hasn't become stained or chipped. I'd highly recommend this set to anyone prepared to break in the lids at first. They're like a new pair of jeans or leather shoes -- a bit uncomfortable at first, but very easy once they have a chance to soften up. If you love the idea of this set and want some accompanying bakeware to go with it, I'd go with the Pyrex Bakeware Dish Storage Set instead.